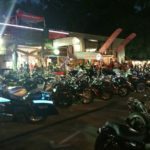 Myrtle Beach Bike Week was a blast! 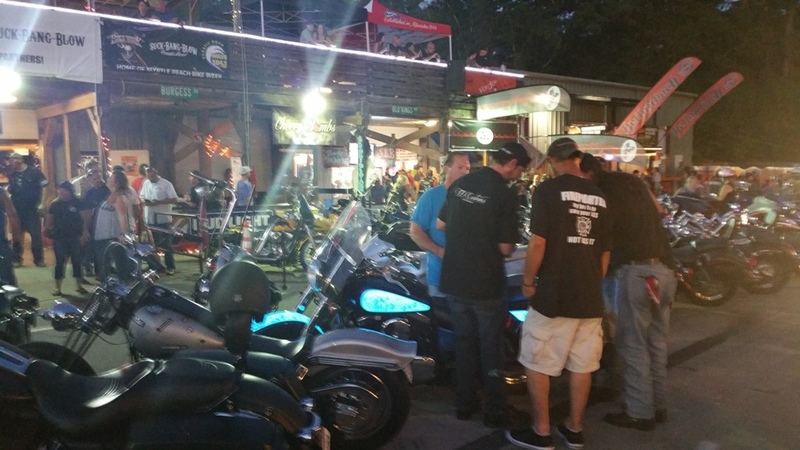 TD Customs was there with our light up motorcycle to show the town what Lumilor is all about. 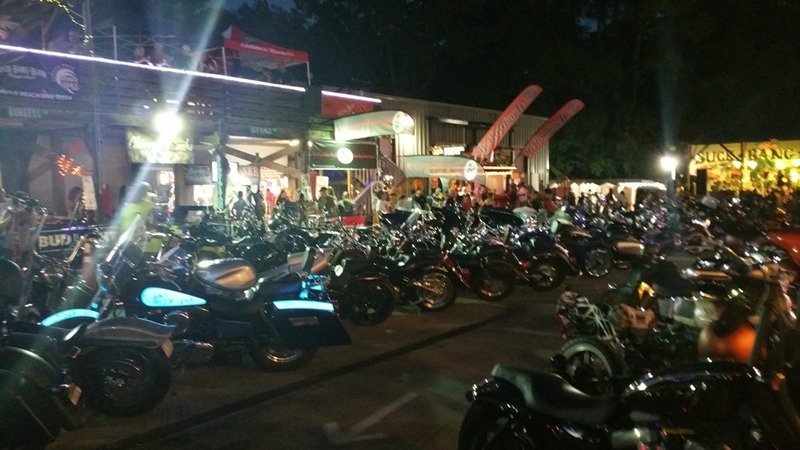 Myrtle Beach Bike Week is a fun time to bring your bike and hit the town with others who share the same passion. 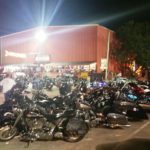 There is a great community of motorcyclists in town during the two bike weeks they have. 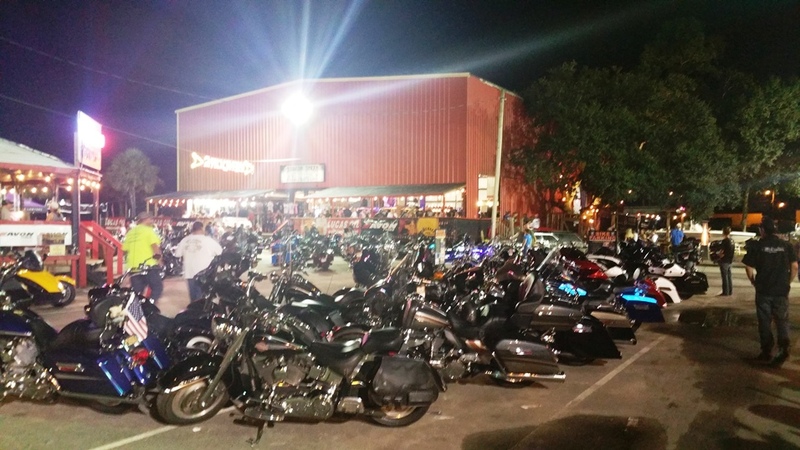 Plenty of bars welcome bikers and have bands throughout the night. 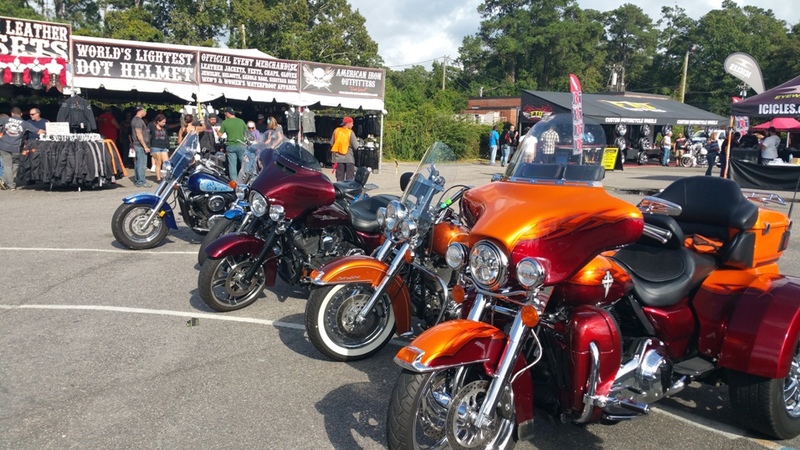 During the day, there are also bands and vendors set up at certain bars and the Harley-Davidson of Myrtle Beach. 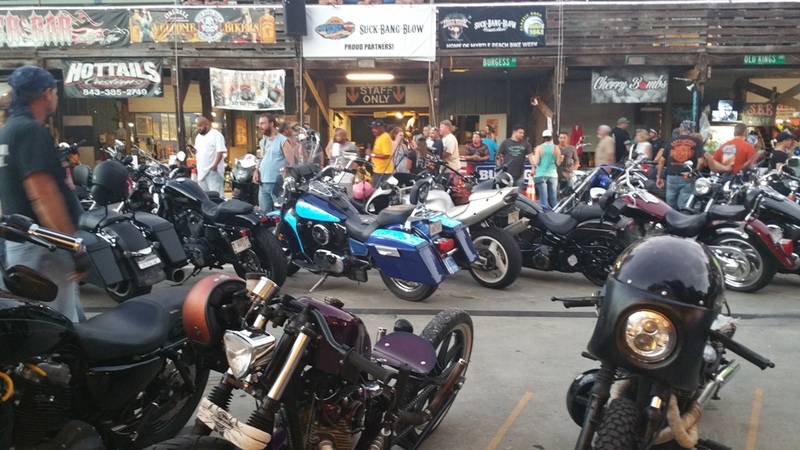 Murrell’s Inlet has a bunch of biker bars. These bars are great because they’re spaced out so you can pull your bike right up within the bar. 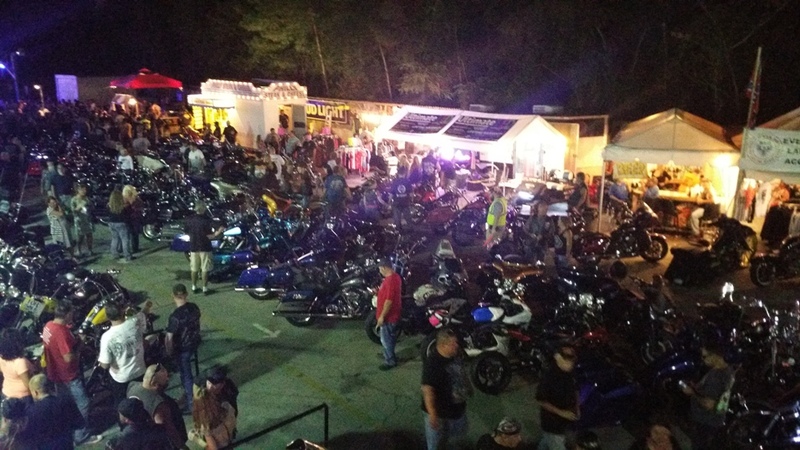 And then it just turns into a big bike show with lots of cool motorcycles to look at! 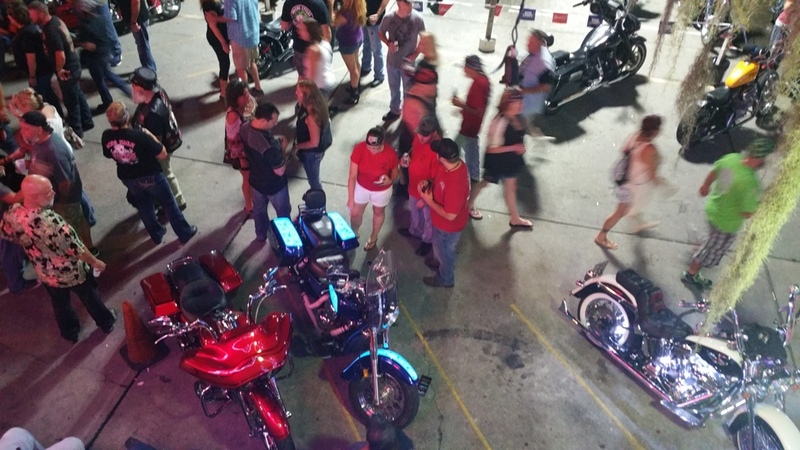 We definitely got labeled, ‘the light up bike’ from everyone who saw it. 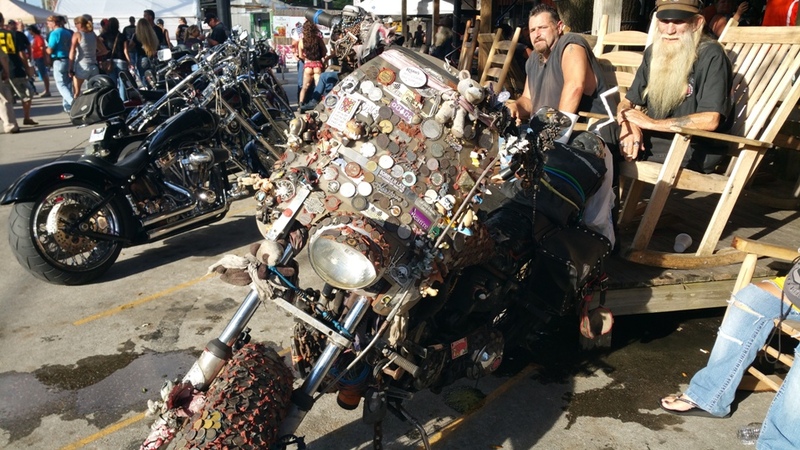 Compared to the other motorcycles there, our bike was probably in the bottom 10%, price wise. 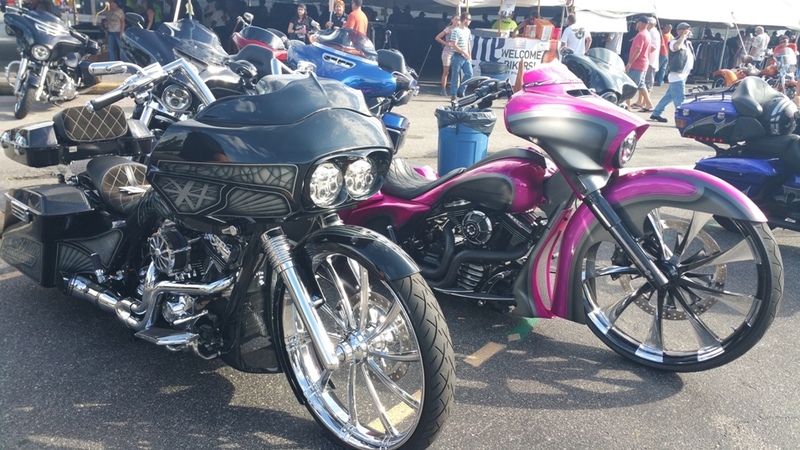 There was some major money in a lot of these other motorcycles. 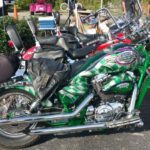 We saw amazing paint jobs, really custom mods, a lot of Harley’s, and many flashy custom baggers. 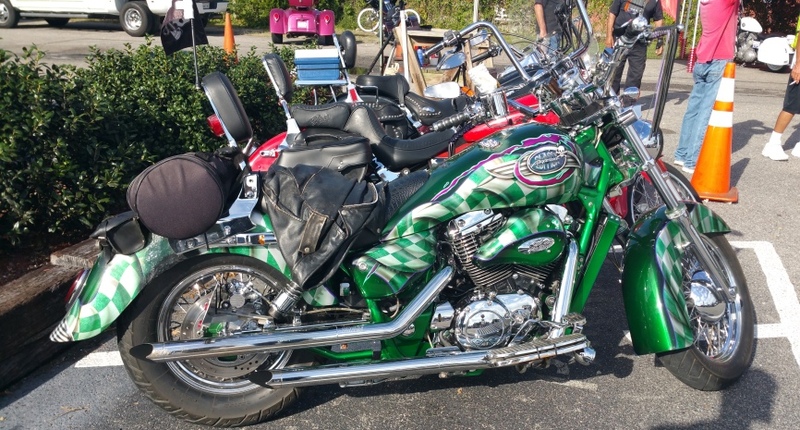 Our bike is an ’04 Kawasaki Vulcan 1500. 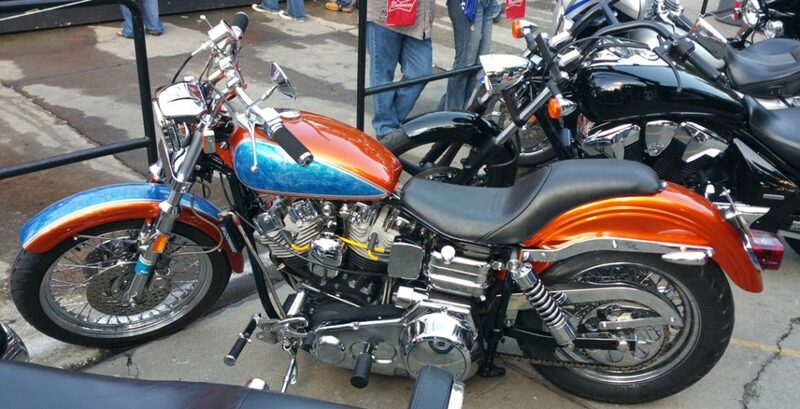 HOWEVER, when the sun went down, our bike was the one that stood out in the crowd. Thanks to the Lumilor lit, electroluminescent paint job. 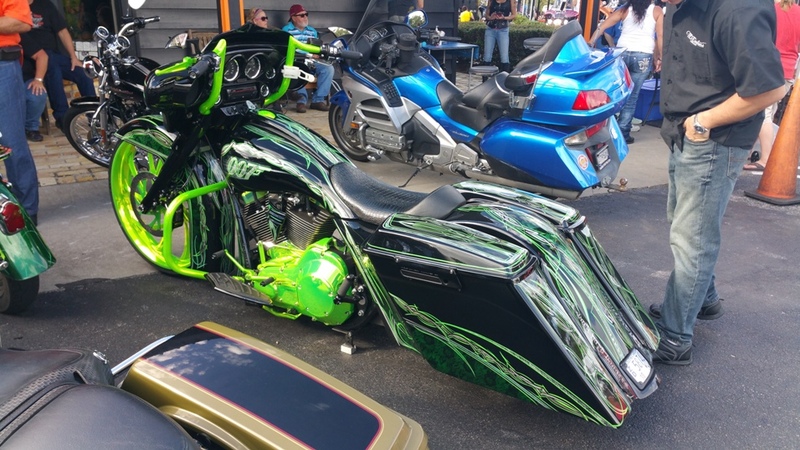 Can’t miss the bike that lights up! Everyone who walked by did a double take. 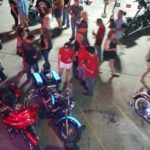 It isn’t often you see a light up motorcycle at night. 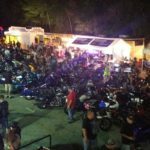 There were a lot of motorcycles with underglow. You see those LED stripes everywhere. But none with an actual paint job that could light up by flipping a switch. It’s hard to miss and people are always impressed. 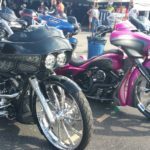 TD Customs Does Myrtle Beach! 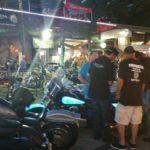 This was our first time going to Myrtle Beach Bike Week. 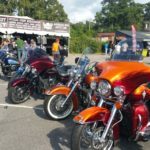 We rode the TD Customs Motorcycle from Asheville to show MB was light up paint was, and had a blast! 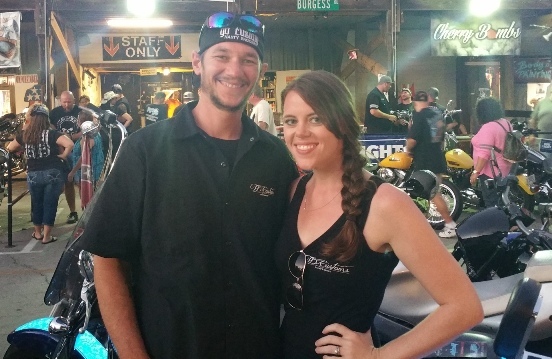 Tim and I got to meet a lot of cool people, and got a ton of attention with our light up bike. On the roads, we’d get people looking over and telling us how cool it was. 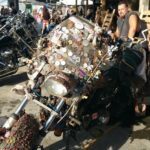 Wherever we parked, we had a crowd come up to us asking questions. Pretty much everyone walked by and looked twice. 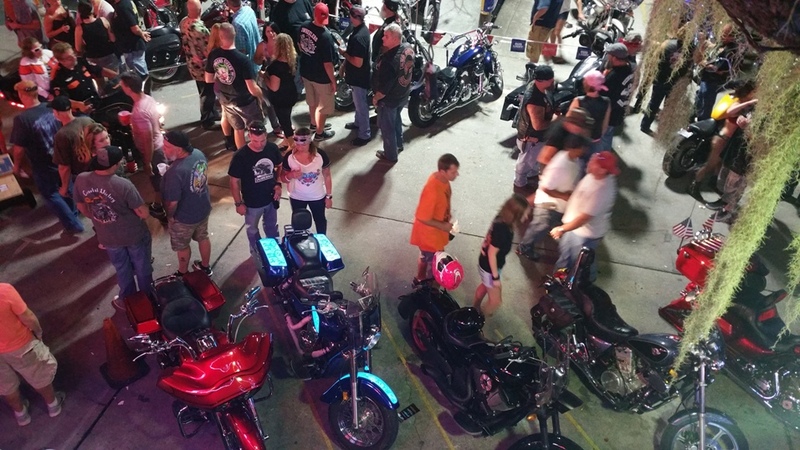 People are still learning what electroluminescent paint is. There’s very little marketing done with the product itself. 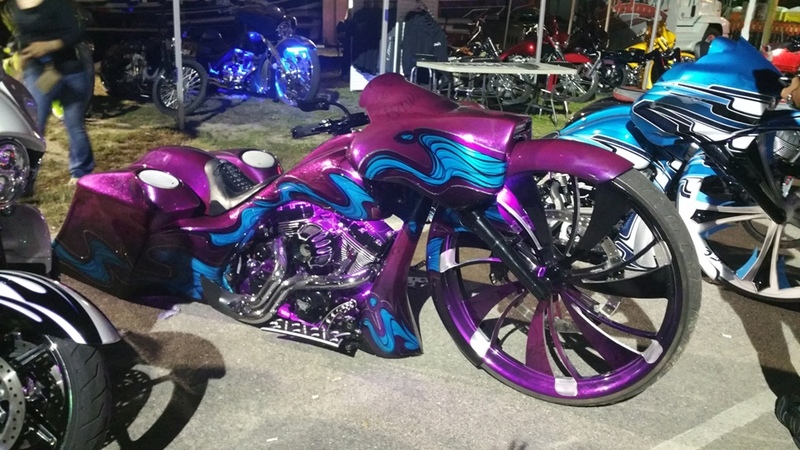 People don’t expect that it’s a paint job lighting up like that. We’re always happy to show how we’ve got it wired and explain how it works. 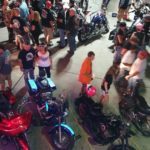 Lumilor is a sprayable electroluminescent coating system that we wire to your motorcycle battery. 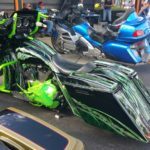 This allows a real electric charge to be connected right to the paint job. With just a simple switch, you can turn the light up paint on and off, on command. There is even an app we can install so you can control the light right from your smartphone! The light up paint is the base. 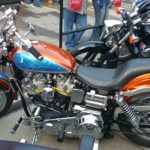 Then we can top coat it in a bunch of different ways – either a solid color on top, airbrush artwork, or specific designs or images you have in mind. Have questions? 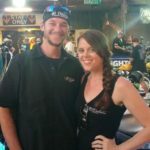 Check out our Lumilor FAQ page. 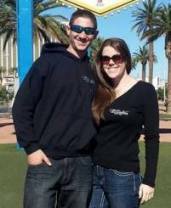 Want to request a quote? Fill out a Get Lit Request Form! 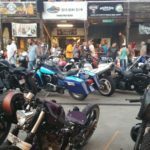 Have you been to a Myrtle Beach Bike Week? Tell us your experience in the comments! 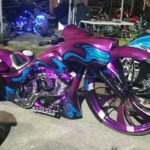 No Replies to "The Light Up Motorcycle at Myrtle Beach Bike Week"